Living in rural America when you’ve always been an urbanite is an interesting experience. The visual change is so disruptive, that I can’t help but notice all kinds of things that might be overlooked in an urban setting. The first time we drove the 80 miles to Austin, I kept remarking how there was no roadside litter. None. Obviously the Don’t Mess with Texas anti-littering campaign is effective! Before we left California, radio stations had their own creative versions of reporting on the unique objects adding to the ugliness of commuting. There were the usual ladders, mattresses, and trash bags. The most gruesome was John C. For some unknown reason, he was hanging on the underside of a truck barreling down the freeway. I’m sure you get the picture. Roadside memorials are everywhere. 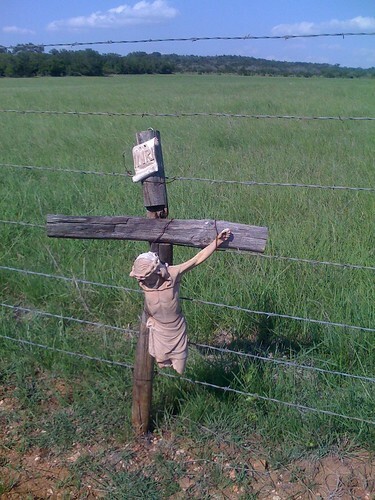 But I’ve noticed that roadside memorials in rural areas become permanent. Land owners allow them to stay and someone regularly tends to them making sure flowers stay fresh, crosses stay righted, memorial tokens rotated. Rural areas honor funeral processions. Anytime there’s a funeral procession to the cemetery, everyone who is driving pulls over and stops their vehicle. Pedestrians stop and wait for the procession to pass. The news spreads quickly when any local military person killed in Iraq or Afghanistan is being honored. It looks like the entire population turns out to line every corner and roadside between the church or mortuary and the cemetery. It doesn’t matter if the service is in one location and the cemetery is 22 miles away. People are there to pay their respects. So I wonder about the picture at the beginning of this blog. Is a roadside memorial? Someone expressing their creativity? It’s on a small, two-lane road by our property outside of town. It’s been there the entire three years we’ve lived here. No one is tending to it. There’s a story. I wonder what it is.